Burlington, IA. - You could feel the wind in yesterday's game at Community Field, which may have led to a few homeruns. 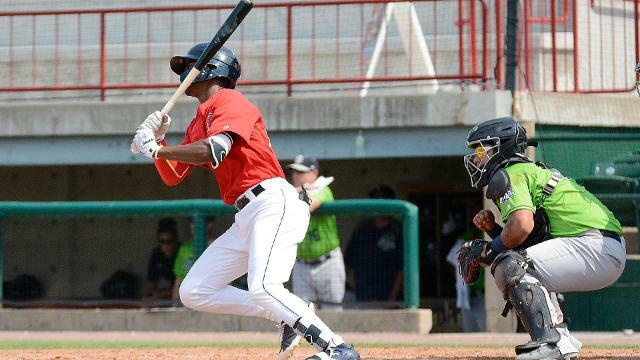 The Burlington Bees (13-27,43-66) were locked in on offense throughout the game, which led to them dominating the Kane County Cougars (20-22,55-56) 16-4. James Ziemba (3-2) picked up his third win of the season, despite having some control issues. Ziemba went two and two thirds innings, allowed two runs on three hits, walked three, and struck out one. 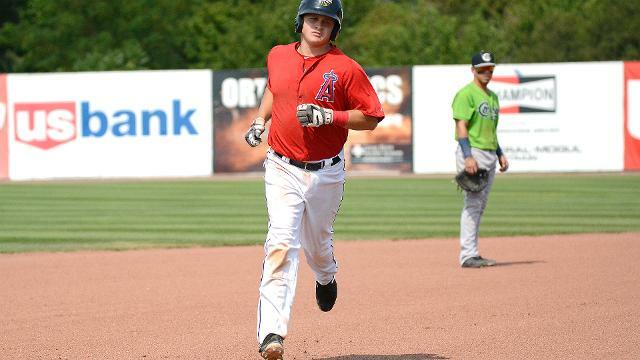 Mack Lemieux (2-9) had a start he would like to forget about, as he managed to go just one and two thirds, allowed eleven runs, six of which were earned on eleven hits, threw one walk, and two strikeouts. Torii Hunter was in the leadoff role again for the Bees and sent a ball deep to right off the wall. The ball ended up bouncing off the wall and past right fielder Ryan Dobson, which allowed Hunter to make it to third for his eighth triple of the season. Orlando Martinez then extended his hitting streak to seven games following an RBI single to left to give the Bees a 1-0 lead in the first. Eudy Ramos got on in the second after drawing a one out walk, and Tra Holmes sent a sharp liner to center that was catchable for Hunter. However, Hunter didn't squeeze it right and the ball ended up popping out of his glove, allowing Kane County to have runners on second and third with one out. That set up Jose Herrera who sent a single to center to drive in Ramos, tying the game at 1-1. Ortega managed to keep Kane County off the board for the remainder of the inning after throwing back to back strikeouts. The Bees would soon take back the lead after loading the bases on a double from Keinner Pina, a single from Tim Millard, and a walk from Kiki Menendez. Julio Garcia then gave the Bees the lead back after barely sneaking a chopper over the head of Ramos at third, easily scoring Pina, and Millard decided to round third too, and barely beat the throw home for another run, giving the Bees a 3-1 lead. Leonardo Rivas then continued his hitting streak to four games on an infield single to short, which allowed Menendez to score, giving the Bees a 4-1 lead. 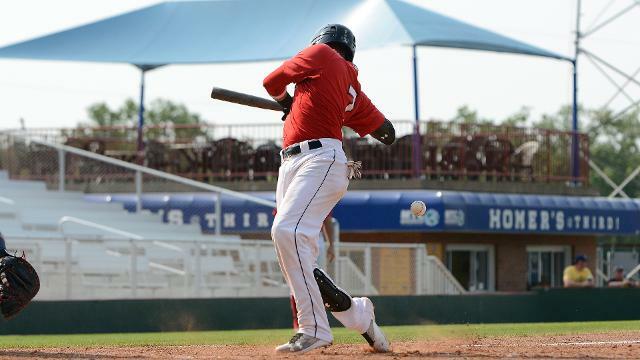 After a pop out from Martinez for the second out, Kevin Williams Jr kept the inning going with a single to left, loading the bases again for Burlington. Spencer Griffin hit a hard line drive into center that dropped for a single, and two more runs scored, giving Burlington a 6-1 lead. The Bees then had a pretty scary moment in Pina's second at bat of the inning. Pina hit a soft grounder to third and Ramos had a late charge on the ball and was forced to rush his throw to first. His throw ended up going off the bag, making Pina and Terence Connelly collide, and making Pina collapse. Pina did appear did to be ok, but Wenson did end up taking over for him at first. 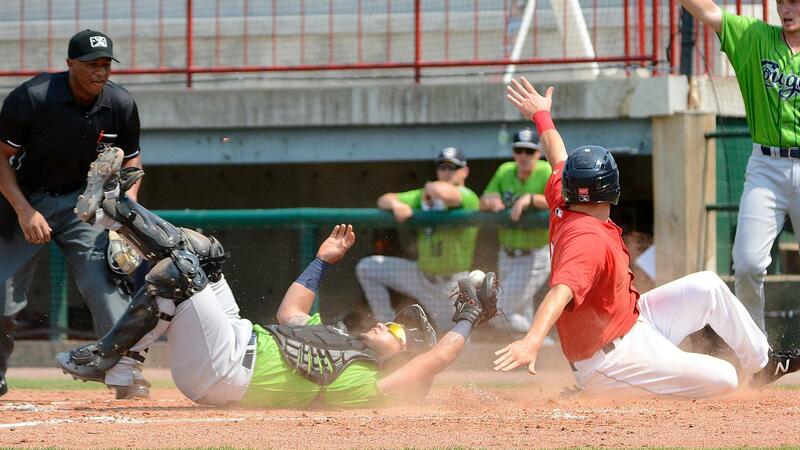 Both runners on base did manage to score, giving Burlington an 8-1 lead. The inning was far from over for the Cougars however, as Millard singled to left for his second hit of the inning, putting runners on the corners. Then Menendez put the Bees up 11-1 on a three run homerun to right for his first homer with the Bees. Burlington got their first two hitters out quickly in the third and didn't look like they would add any more damage in the third. That was before Martinez drew a two out walk, and Williams sent his 13th double of the year to center for an RBI, giving the Bees a 12-1 lead. 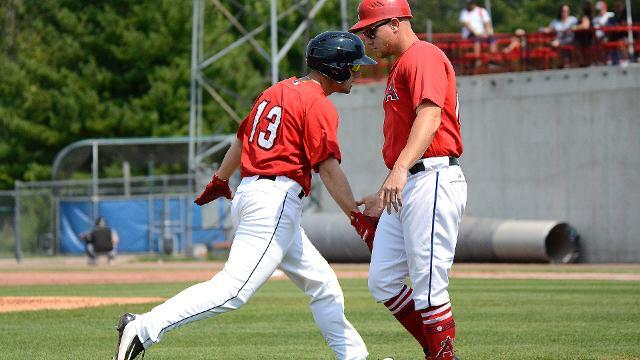 Millard added one more in the fourth after hitting his first homerun with the Bees over the right field wall for a solo homer, giving Burlington a 13-1 lead. Jose Caballero hit his second homerun of the series in the top of the fifth, barely hitting it over the green wall in center for a solo homer to make the score 13-2. The Bees took full advantage after Juan Torres walked three straight to load the bases in the sixth. Tim Millard hit a little blooper pop up in shallow right that dropped for a single to score Williams and make the score 14-2. Garcia was later on hit by a pitch with the bases loaded to score another run, and Hunter grounded into a fielder's choice. Garcia was out at second, but Wenson managed to score, making the score 16-2. 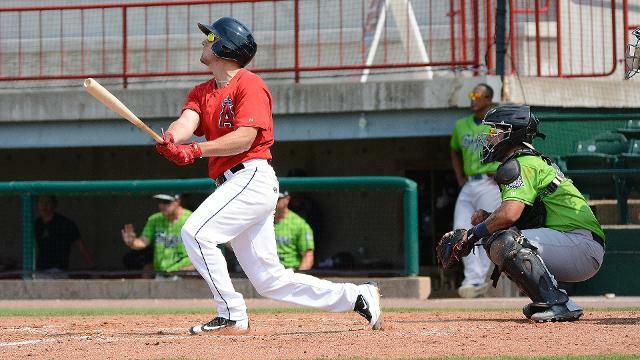 After hitting three homeruns in game one, Kane County kept the power going in the seventh. After Dobson led the inning off with a walk, Yanqui hit one deep to left, but it went foul over the bullpen wall. Then on the next pitch he sent one deep to right center and that one was plenty fair for his fifth homerun of the season, making the score 16-4. Kane County would keep the inning going after a double from Cintron and a walk from Ryan Grotjohn, but Ziemba would pitch his way out of it with a pair outs. In the past few games, it's been the Bees first three hitters of their lineup that have been doing a majority of the damage. Yesterday's game was a different story though, as it was the seven, eight, and nine hitters who had the big games for Burlington. Millard was the one who led the Bees offense with a 5-5 day at the plate, and also drove in two runs. Menendez drew a walk and had just one hit, but his hit did drive in three runs on his homer to right. Garcia batted in the nine spot and also went 1-4, but drove in two runs on his single, and also earned one after getting hit by the pitch. Spencer Griffin also had another impressive day at the plate, finishing with two hits for the third straight game, and driving in two runs. Although Caballero was just 1-5 in yesterday's game, his one hit was another well hit homerun, and he is looking like a very good addition to the Kane County lineup. 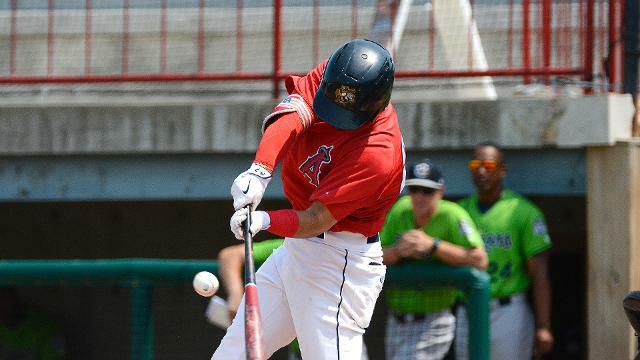 Caballero joined the Cougars back on July 29th, and is currently hitting .406, has hit two doubles, two triples, two homeruns and has driven in six runs in just eight games for Kane County. The Bees will conclude their series against Kane County tomorrow night at 6:30, as both teams will battle to take the series. The Bees are expected to start Michael Santos, who is 2-1 with a 3.44 ERA in three starts and 13 total appearances. Santos has done well in his three starts, pitching a total of 14 innings, and only giving up three runs. The Cougars are expected to go with Cole Bartlett, who is 3-1 with a 4.17 ERA in two starts and 20 total appearances.